Crespo’s Worms Tournament (commonly known as CWT) is a tournament known for its high-level competition. It was founded by Crespo in July 2002 and has been hosted on a yearly basis ever since. In the beginning there are subjective ratings. About a handful of people are chosen to rate the 32 participants and sort them into pots A to D with descending strength. Any of the eight groups get one player of each pot. The best two attendees of each group advance to the knockout stage. Games here are best of five as well. The final and the game for the third place are played best of seven. The tournament system is often compared to the one of the UEFA Champions League, especially because there have been home and away games (first leg and second leg games) until 2010. This system was a rather untypical approach for the community, but it was originally introduced when players were able to pick different Normal schemes. That was abandoned in 2007. In a move taken by Zemke in 2011 the home and away system was abandoned, too. “An absurdity of last year  is that only 8 out of 90 games were won by the loser of the first game,” he reasoned. Group stage games are now played best of five in place of two best of three games. In 2009 the admin team introduced something they called “fixed schedule”. Prior to the tournament’s start the attendees had to inform the staff about their preferred times to play games for CWT. Games were then scheduled by the admin team and an Excel spreadsheet was released. It ultimately resulted in a disgracefully high amount of bans. The acts of the admin team—which became smaller as the tournament went on—remained very questionable and occasionally raise arguments to date. Qualifiers have occasionally taken place before a tournament to find the very best players to play the actual tournament. That has been the case for the first time in 2004 and then again in 2005 and 2009. Usually there are more people who would like to take part than the actual limit of players (32) permits. The number of attendees was extended to 40 which was again in consideration for 2011, but wasn’t applied then. Nowadays signing in for CWT is only considered an application and it’s on the admin team’s behalf to pick their 32 favorites for the tournament. In 2015 they chose to have qualifiers, but it remains to be solely up to the admin team to select players themselves or have qualifiers take place. 2016 saw qualifiers again with a record number of 57 applicants of which of which only 13 made it directly into the tournament and all the other applicants were drawn into the qualifiers. A poll prior to the tournament in 2007 led to a radical change in CWT’s history. It had been possible to choose a variety of schemes to play before 91 percent decided on Intermediate to be the only scheme to be played in future editions of CWT. Previously various Normal schemes such as Intermediate, Pro, Elite and Tournament were part of every year’s tournament letting it off to the players which one to play. Even though the decision seems clear, it has also been criticized. SirGorash, the co-founder of NNN and initial creator of the Open Normal League, stated, “This way CWT will no longer be CWT. [...] I wanna play Normals, not just Intermediate [...].” However, Intermediate has risen to tremendous popularity over the time. Winning CWT is nowadays considered by many Intermediate fans as their biggest goal. Still, the Intermediate scheme has gone through some changes itself. By the time Intermediate was chosen to be the only scheme in Intermediate, another poll resulted in the removal of crates. The mostly random factor of crates had too much influence for some. Possibly that has been the starting shot for CWT to become more and more prestigious and competitive. In 2009 there was an alternative Intermediate scheme that rose to fame on The Ultimate Site. It worked differently in sudden death scenarios by removing the health reduction. Its consideration was fading though. For many players the health reduction had been an important strategical part of the scheme for years. Also the scheme had to suffer a very controversial edition of CWT in 2009 and thus got not as much attention. The Worms Armageddon update 3.6.30.0 reintroduced the two turn jetpack delay the scheme originally had had. Live streams of CWT games first emerged in 2011. The Russian guy Kalababa streamed several games to a lot of people in Russia. Another person from Russia named Khamski took it one step further and subsequently live streamed games to a big crowd of the Worms community. He has also introduced commentary in English. Interactive live streams became increasingly popular. Viewers would chat simultaneously to watching the stream and commentators picked up discussions in the chat to talk about them live. The semifinal in 2011 played by Dario and Mablak garnered huge attention even abroad CWT. In 2012 live streams were taken a step further again. 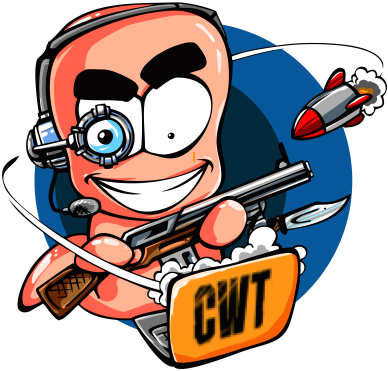 Anybody could now create his channel for live streaming games on the website of CWT. There are even a few possibilities to modify a channel such as choosing the color, name and writing a text to the stream. The channels were integrated into the website in such a way that they started going online automatically by taking advantage of a scheduele in which players organized their games. By the end of CWT 2012 there were close to ten channels registered on the site. Definitely more than expected. Crespo, who at that time founded CWT eleven years ago, took part in commenting games along with Kayz, Nappy, Jakka, Zemke and possibly others. In 2015 live streaming found itself served with new features on CWT’s web presence again. An index of all CWT broadcasted games has been introduced. For the first time there is a single and centralized way to find all broadcasted CWT live streams with various sorting and search functionalities included. An integration with the Twitch.tv API allowed for another feature such as linking games on the CWT website with broadcasted live streams on the Twitch.tv website. One is able to view a detail page of a game on the CWT site and the system will try to find a broadcast of that game on Twitch.tv. Also live checks have been introduced. Whenever there is a live stream taking place the user will receive a push notification on the CWT website. Websites for CWT were used to visualize the current state of the tournament including current standings, group draws, the playoff tree and played games. These information was entered by hand in plain HTML for a long time. In some editions CWT attendees were asked to write forum entries that would later on be used to create profiles on the website. The website also featured an archive of past CWT editions. On January 23, 2010 the website experienced the first change. Actually an entirely new website was built by Zemke. He himself approached the community at the mentioned date to create a new website that would feature more automatism than before and thus ease the lives of moderators. Zemke stated, “I like webcoding and programming a lot, it’s inspiring and the main reason for my recent inactivity.” As a matter of fact he’s already started to built a website for CWT before asking for it. The website was then another two times renewed by him and nowadays offers a wide variety of features and extends possibilities. An album of pictures of CWT’s website through the years can be found on their Facebook page. Prizes have been part of Crespo’s Worms Tournament many times. There have been t-shirts in 2003 and 2004. In 2009 the winner Johnmir was sent a cup to his home in Russia. As of 2010 the yearly prizes include three cups for the three best attendees and a money prize for the winner. All together about $550 have been distributed to the winners of CWT 2010, 2011 and 2012 and ten cups have been sent off within four years. It soon became a tradition to publish photos of the winners with their cups. The money for the prizes was donated by CWT attendees and benevolent people who just like CWT. In 2011 more than half of the CWT participants have also contributed a donation. The improving prizes have been becoming increasingly conducive to the tournament’s growth in prestige and seriousness. Crespo’s Worms Tournament was played on Worms World Party from its beginning until 2006 and partly 2007. This page was last modified on 16 October 2016, at 17:06.